Posted on June 26, 2012 by Thomas D. Shults, Esq. 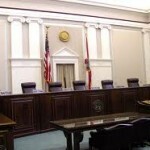 On June 25th two private citizens represented by the Southeastern Legal Foundation filed suit against the three Florida Supreme Court Justices runing for retention election this year. The Justices are required to face the retention election in order to remain in office and were required to file their qualifying paperwork before a noon April 20 deadline set by law. The suit alleges that the Justices used state employees in the rush to complete their paperwork in violation of Fla. Stat. 106.15 (3) , and further alleges that the paperwork filed was incomplete and contained false statements. The suit ultimately seeks an order holding that the Justices are not qualified to be on the November ballot, which would result in their terms ending on January 1 2013. 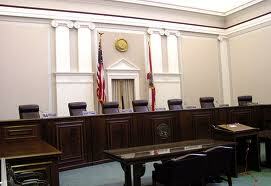 This entry was posted in Candidate qualifications, Litigation Updates, Redistricting and tagged candidate filing deadline, Candidate qualifications, florida election attorney, Florida election controversy, Florida election disputes, Florida election law, Florida election lawsuit, Florida election suit, florida supreme court, judicial candidate, Thomas Shults, Tom Shults. Bookmark the permalink.